A running robot for beginners as well as experienced developers: With the “Hexapod Robobug”, consisting of electronics, mechanics and digital high-performance servos, you can build your own Hexapod running robot and enter the exciting world of robotics! The "Hexapod Robobug" is the ideal basis for entering the fields of electronics, mechanics and programming: it enables a large number of extensions by using additional user boards such as Arduino, Raspberry Pi or NodeMCU and offers space for many additional components. 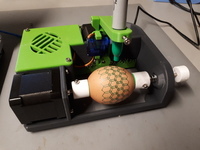 The robot is designed in such a way that it can be either controlled without programming using a remote controller, similar to an RC model, or moved automatically with help of an user board. Thanks to its expandability and flexibility, the robot is perfect for hobby, research, schools, education and training and encourages independent development and expansion. Centerpiece of the Hexapod Robobug is the locomotion controller board. Together with the open-sourced locomotion software, the controller takes care of coordinating the 18 servos to get a smooth and naturalistic movement of each leg. So the basis for all movement processes is already given and you can concentrate on the fun part of programming your own Robobug: Making it smart! Even beginners can easily set up their first automated sequences of movements. But also experienced developers will find their challenges for example with teaching the Robobug to follow an object or simulate the behavior of a real bug… or rather of a frisky pet? There are thousands of ideas which can be implemented! That makes the Robobug perfect for research and education, as well. Inventor & Developer of the Robobug is Ulli Sommer, hard- and software developer and author of several learning books. His intention with this project was to create a platform which helps beginners as well as professionals - and pure mechanics as well as software specialists. The goal was to lower hurdles for taking the first steps into comprehensive robotics. It had to be easy, open and extendable. And so, after one and a half year of developing and prototyping, the “Hexapod Robobug” was ready to launch in October ‘18. For more information please see our documentation links. 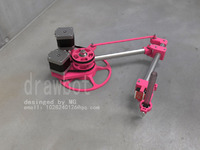 The Robobug and especially the software is peculiarly adapted for the Makerfactory Hexapod Board. However, for hobbyists, students, engineers and teacher with sophisticated knowledge in programming it is possible to adjust the software for using it on user boards. The mechanical parts are available from many sources. Nevertheless, we recommend to use the following parts as they fit best on the 3D-printed parts. Build instructions and software bundle are available in other languages, too. 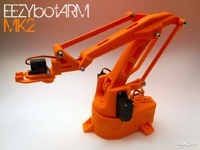 Please click here and enter “Robobug” as keyword.